Here's how you can go about killing and tracking the Dodogama in Monster Hunter World. The Dodogama might look like one of the sillier creatures in all of Monster Hunter World, but it can still put up one hell of a fight. In this Monster Hunter World Dodogama guide, we'll be walking you through everything there is to know about tracking down and killing the monster, as easily as possible. Should you instead need anything else at all on Monster Hunter World, such as how to safely capture any monster in the game with a shock trap and tranq bomb, or how to track down any monster using the Scout Flies to your advantage, head over to our Monster Hunter World guides walkthrough hub. All throughout Monster Hunter World, you’ve seen elegant beasts like the Legiana soar through the skies, or ferocious monsters like the Odogaron intimidate even the most skilled hunters. 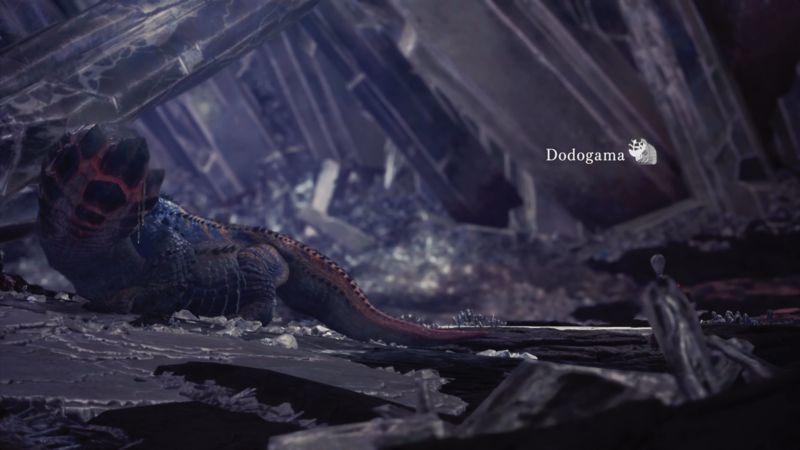 The Dodogama fits into neither of these categories, looking not dissimilar to an oversized lizard, that scrapes its bloated belly along the ground, not a million miles away from the Great Jagras back in the Ancient Forest. Laughable though it is, the Dodogama can still put up a fierce fight against any Monster Hunter World player, especially when you come up against it in the treacherous region of the Elder’s Recess. You’ll want to bring armor that has both an incredibly high defense rating, as well as one that can protect you against fire attacks, as this is the area that the Dodogama specializes in. In order to take down the Dodogama in MHW, you’re going to have to be quick on your feet. We’d recommend taking one of the Bow weapons with you into battle against the beast, as you can stand back and blast it with specialized Piercing and Blast ammo while your Palico temporarily distracts it. Alternatively, you could wade into the thick of the fight with a quick weapon like the Dual Blades or Insect Glaive, or even the Long Sword, which would allow you to maintain some distance from the Dodogama. But if you get up close to the Dodogama, then you’ll have some pretty ferocious attacks to deal with. 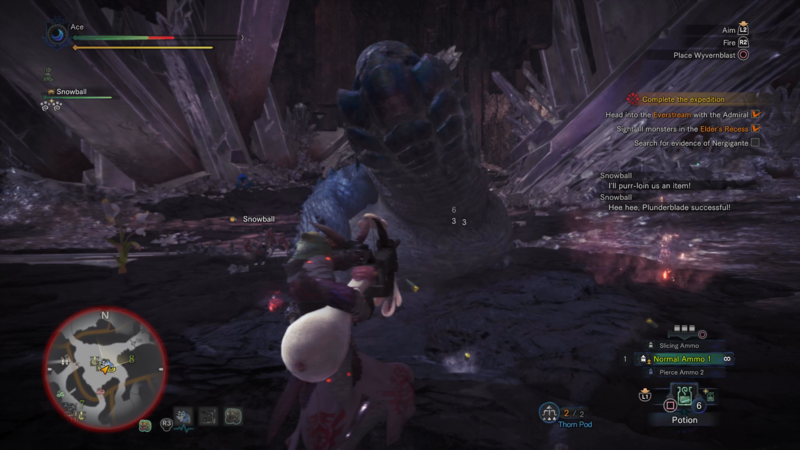 One attack the Dodogama loves to pull off is thrusting its head into the earth, and burrowing forward across the battlefield, damaging everything in its path. Another attack to watch out for if you’re close to the beast is that pit of the lava, where the Dodogama rears its head back, before turning orange and belching out a pool of lava right in front of it. This can be fatal to hunters on around half health, so it’s definitely an attack you’ll want to watch out for. 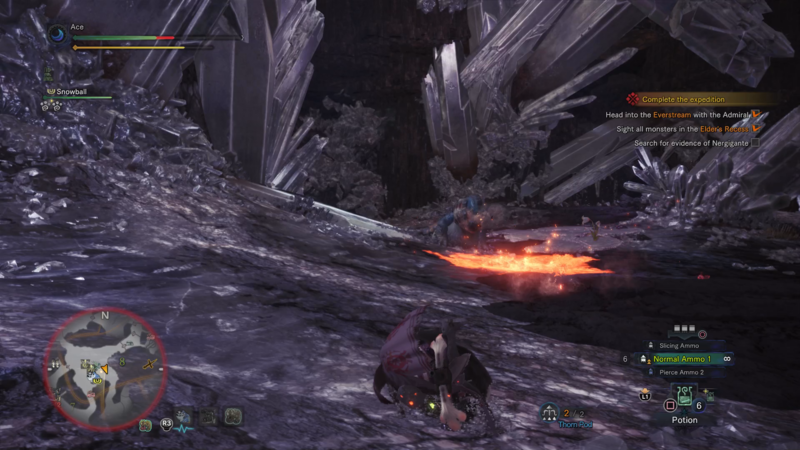 If you chose to bring a Bow weapon with you, and keep your distance from the Dodogama, then the beast still has ways of reaching you. A deadly attack that comes in two forms is where the creature pelts you with a fireball or five from range, all of which have a fairly excessive blast radius once they hit the ground. If you ever see sparks coming out of the mouth of the Dodogama, then you know it’s time to stow your weapon and run parallel to the beast, hopefully avoiding the incoming fireballs. We might be all done with our guide on how to take down the Dodogama in MHW, but we have a wealth of other Monster Hunter World guides, including our full weapons guide, as well as our guide on the best armor in the game.